Breakin' Atmo expands the 'Verse with 25 exciting new Jobs and 25 new Supply Cards. Shiny new gear and interesting new Jobs to add to your game. 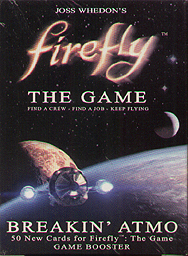 For use with Firefly: The Game, not a stand alone product. Like the previous reviewer stated this really is a no brainer, if you already have the base game then this adds a load more cards (jobs, equipment and people). I love firefly and this has just added to the enjoyment of the game. This is a no-brainer purchase for owners of Firefly: The Game. This adds a bunch of extra cards for the decks and the new job cards have different payment schemes which are interesting. This gives players more options and variety in the game which is never going to be a bad thing. The quality of the cards and artwork are at the same level of the orignals. Really happy with this added into my game and see no reason to remove the cards, though they are marked with a symbol on the front for those who wish to.